June is National Dairy Month, and I am dairy excited to be partnering with the American Dairy Association this year to bring you delicious treats to help you get your recommended servings. All things summer are happening around our house. That is just udder-ly ridiculous that it is already June. Wasn’t it just snowing the other day? We even did our big family vacation last week after the last day of school was over. Our summer calendar was already full, so that week was the only one that worked well for us to get away. Now we are home and adjusting to our summer schedule. Those are two dreaded words that all school kids do not like to hear during the summer. 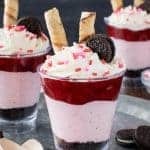 My husband and I want to be dairy sure that our kids are not spending all their time watching TV, and that they are eating healthy while they are home this summer. There will be plenty of fun things that they can do for the next 2 1/2 months that do not involve screens. Today they are already pulling out the sprinkler for some extra ordin-dairy fun on the trampoline. My job this summer is to make sure that they are making good choices when it comes to eating. I want to make sure they are grazing on fruits, veggies, yogurt, and milk this summer instead of the cookies and cake that is always in our kitchen thanks to the crazy baking I like to do all the time. Did you know that most people do not eat the recommended servings of dairy each day? Dietary experts recommend 3 servings of low fat or fat free dairy each day. Most people need to add another serving of dairy per day to reach that quota. Milkshakes are one of our favorite summertime treats to make. They are so easy to customize and change up each and every time. Our kids are always in the moo-d for a cold treat on a hot day. Scratch that…they like these on any day of the year. It keeps me moo-tivated to make these icy treats a little bit healthier for them. 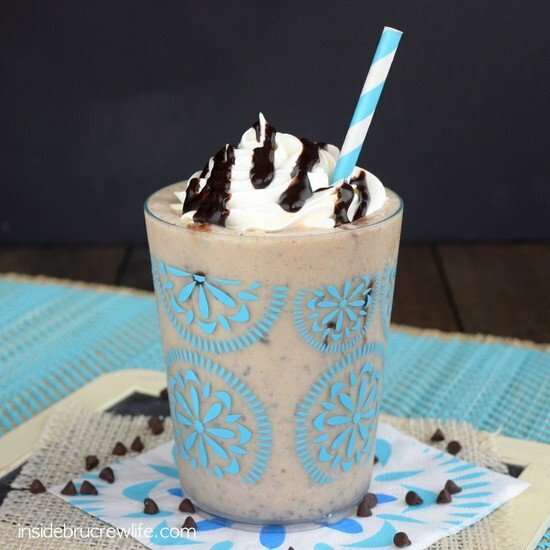 I used frozen yogurt mixed with coffee and chocolate milk to create a fun version of our favorite coffee house frappe. That’s a double whammy of protein and dairy in each serving. My kids had no idea they were drinking a healthy shake. This is one healthy treat that I will definitely be milking for all it’s worth. 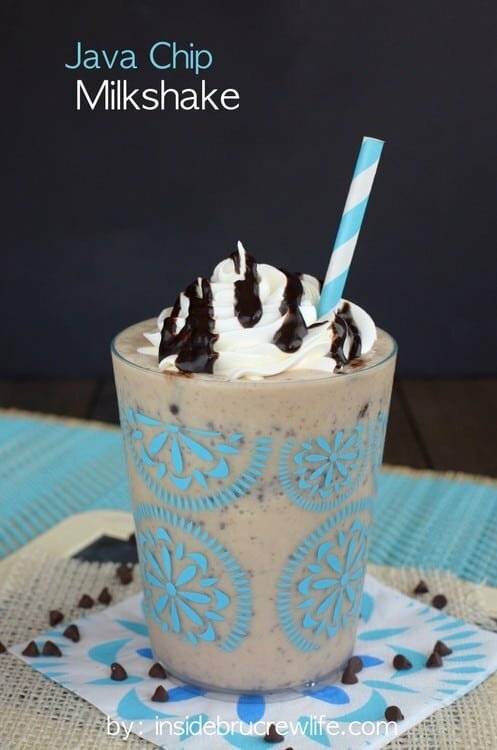 Frozen yogurt and chocolate milk mixed with coffee and chocolate chips makes this Java Chip Milkshake the perfect way to get another serving of dairy in your diet. 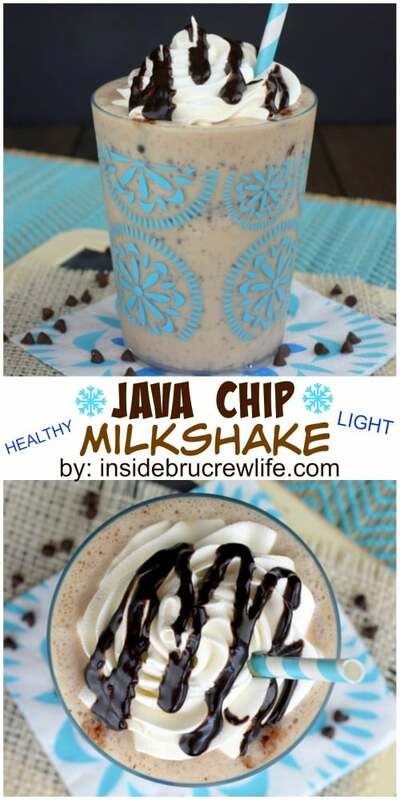 Combine the frozen yogurt, cooled coffee, chocolate milk, and mini chocolate chips in a blender. Pulse until combined and the chips have been completely incorporated. Pour into 2 glasses. Top with Cool Whip and chocolate syrup. Serve immediately. Kick off summer by joining all of us and the American Dairy Association for a Dairy Twitter Party on June 11th, 9-10 pm EST. There will be dairy tips, summer family ideas, and plenty of dairy recipes to get your mouth watering. It is going to be a moo-velous time! *The American Dairy Association compensated me to create a recipe and blog post. All opinions expressed in this post are 100% my own. Is it horrible I”m dreading summer? All the whining… 😉 Love this milkshake! LOVE all your dairy puns!!! 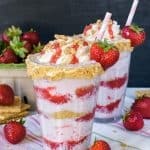 And this milkshake, totally irresistible and perfect for summer! Totally cool, totally refreshing, totally perfect! Milkshakes are my favorite food! Love the java chip! Looks delicious! You had me giggling the whole way through this post with all those puns. But seriously, milkshakes and coffee…two of my favorite drinks! You made me groan a lot just now with all those puns! But I’m still happy because this milkshake is lovely! Love milkshake season! Wow! This shake looks sow fantastic, I can’t wait to try it! Also, your kids get a crazy long summer break. Our schools are still in session and they go back August 11. I am trying to figure out how to add healthy snacks to our day as summer approaches. We’ve been eating a lot of Greek yogurt but I am sure the kids would enjoy this as well! Hehe, I love all the puns in this post. Oh my, this look absolutely divine. It’s times like this I’m so bummed that I dislike a cup of joe. I could definitely wake up to this bad boy in the morning. Seriously . . . not even two seconds ago I was thinking how good an iced coffee sounded. A coffee milkshake sounds even BETTER!! Jocelyn, you are so cute — absolutely adorable with all of the dairy-related puns! How does your creative side come up with all of these things?? I love it! And this milkshake sounds absolutely perfect for me. The vanilla froyo (probably one of my favorite healthier frozen treats! ), chocolate, and coffee… I’d be slurping up multiple servings a day to happily get my daily dairy servings! 🙂 Hope you and your family are able to adjust to the summer schedule stuff really quickly! You sure know how to make a milkshake look incredible! Love how perfect that chocolate drizzle is! 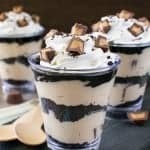 And I can’t resist a good milkshake – they are one of my husband’s very favorite desserts! LOBE THIS!! Summer in a cup! LOVE THIS!! Summer in a cup! Haha love your cute dairy puns, they were very amoosing 🙂 Love the sound of this milkshake with the frozen yogurt and coffee – sounds so refreshing and that chocolate drizzle is just perfect! I must say, this shake looks fantastic. Love all your little cow terms throughout your post–very cute. Pinning! I see yogurt and coffee in this milkshake…which is part of my usual breakfast..YES! 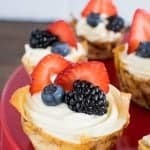 This is just the kind of snack I’ll need to have the energy to keep up with my boys all summer! Yum!! Love that this uses frozen yogurt instead of ice cream – my son will be all over this! This shake sounds fantastic! I wish I were sipping on one right now! As soon as I saw this, all I could think was GIVE ME! It looks so good! Reminds me of Starbucks. 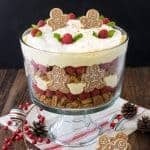 I’ve totally got to make this! Can’t imagine it could be anything but delicious. Hope you’re week is going great Jocelyn! I swear I think you read my mind sometimes, Jocelyn! I’m posting a coffee-inspired smoothie tomorrow! But oh man this milkshake makes me wish I had made mine into a milkshake instead! What a lovely summer treat! These take me back to my starbucks days and where I would sneak a sample of leftover Java Chip Frappucino’s! But these are way healthier…win! Yummo! I love this idea! Pinned! Haha! Your dairy puns cracked me up! But this milkshake is on laughing matter, I would never guess this is a lower fat, healthy version! Hahaha, you are so funny! I’ll drink me up one of those! I want one!! I want that glass and a huge bottle of thick chocolate sauce too please!! Yay for dairy and swoon-worthy milkshakes! 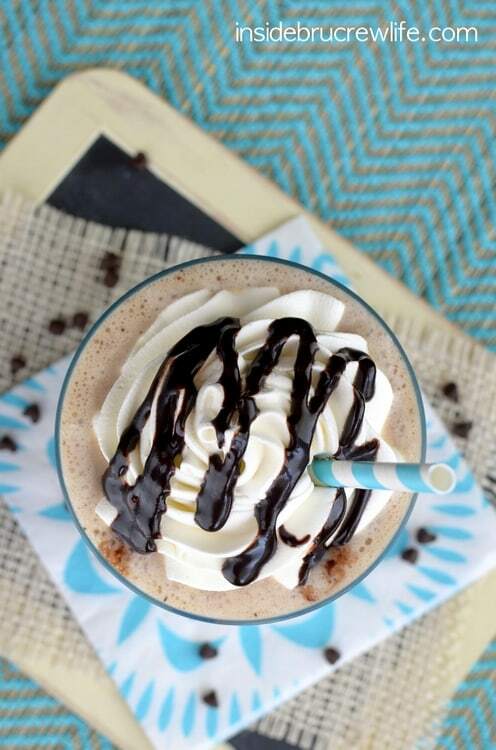 This looks like Starbucks’ Java Chip frapp but MUCH healthier and better since it’s homemade! 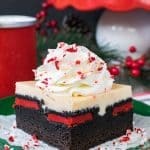 Oh my lordy this looks delish! Java chip anything is one of my favorite flavors. Thank you for sharing!